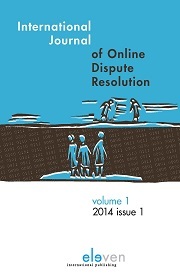 We are pleased to announce the launch of the International Journal of Online Dispute Resolution – an online journal presenting current initiatives and developments in the field of online negotiation, mediation and arbitration, as well as best practices and opportunities. The Journal publishes original and peer reviewed papers, reports, case studies and notes, book reviews, and commentaries. ODR offers new ways of settling disputes, and new opportunities for practitioners to diversify and broaden their practice. The Journal will explore all approaches to technology-assisted dispute resolution, including online arbitration, a field of growing importance in the commercial context, both at the national and international level. The topics covered by the Journal will range from national and cross-border ODR systems aimed at streamlining and improving legal and alternative processes in developed countries, to mediation of conflicts in the poorest or most violent parts of the world. • Technological applications in dispute resolution. • The resolution of technology and telecommunications related disputes. • Legal and technical aspects of innovative technological applications. • Cross-cultural and legal comparisons in dispute resolution and technology. • Digital divide implications and applications. • E-commerce, M-commerce and dispute resolution. • Resolution of e-governance/government disputes. • Electronic funds/data transfer for dispute resolution. • Cyber ethics/e-privacy/e-security for dispute resolution. • Legal aspects of social engineering. • Technology/telecommunications dispute resolution & policy. • Any other topic that touches upon the interplay between technology and dispute resolution.